Whether you are building an online business from scratch, trying to get more traffic to your site or just searching for Keywords for a local business website or a niche market…it all starts with keyword research and of course the question often asked is what’s the best keyword tool? It is usually software that allows you to undertake research and analysis of specific keywords in order to help you uncover the most frequently used keywords in your industry or niche that have a high search volume. Why is that important? Because you don’t want to waste time, after you have built your website, trying to get it on a page in Google where it gets traffic. There is little point in trying to optimize your website content for words or phrases that do not generate traffic. Yet this is what many people attempt to do. To have long-term success with your website or blog, there is no better way to get very targeted visitors to your site for free over the the long term, than with ‘organic search traffic‘ and this methodology therefore needs to be the focus of your traffic search engine optimization (SEO) focus. To get this organic search traffic you will need to utilize frequently used keywords in order to rank well within Google and this is one of the most common methods used for ranking in search engines because without keywords, it would be difficult for people to find your articles, pages and posts. Yet when it comes to keyword research, many people have difficulty with this process and often resort to Google directly and perhaps even to Google’s popular Keyword Planner in an effort to select appropriate keywords. But this popular tool, is not very user friendly and is difficult to use, as it is hard to figure out how to find ‘rank-able‘ keywords. By ‘rank-able‘ I mean keywords that you can actual ‘rank‘ for. Keywords that you can actually get a ranking for are the backbone of targeted search engine traffic and making money online. The problem is that Google’s Keyword Planner rounds up the search queries (sometimes excessively) and does not provide you details as to the actual competition for a specific keyword. In a nutshell this makes searching for ‘rank-able‘ key words very difficult as the key word might show a high traffic volume but it often turns out to be very hard to rank for, because of the sheer number of competing sites also using that same specific keyword. This lack of information about a particular keywords competition can making ranking very difficult and that can be very discouraging for a lot of people. So if you want to rank well within Google you need to also target low competition keywords. These are the keywords that are easy to rank for and will ultimately lead to more targeted traffic. Keyword competition is extremely important. It is essential that you search for and find keywords that have low competition. This is because a keyword that is too competitive, means you are in for a long up hill battle, just to get ranked and a lot of frustration and disappointment along the way. The best SEO software tools are those that prevent you from making costly mistakes. For a long time I neglected the importance of low competition keywords because I was unaware of this aspect of keyword research. 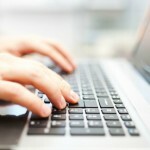 What’s the best keyword tool? Is Jaxxy and it’s so easy to use. It not only gives you targeted information about keywords, it finds and displays related ideas to whatever topic that you are trying to write about. It actually brainstorms for you and gives you options. Can you believe that? Jaaxy is a Keyword Research Tool that extracts and simplifies Google’s mountain of keyword data and helps you find low competition keywords that will give you tons of traffic. It strips data from Google’s search engine results and other databases and compiles the information into a simple platform that makes finding keywords a walk-in-the-park. It has been called the number one keyword research tool on the market- by those in the know. If you are trying to get your site on Page One of ANY Search Engine, then Jaaxy is the perfect tool to give you the advantage. Regardless of whatever niche or industry you may be in, you will see amazing results using Jaaxy. Your competition won’t know what hit them. Take a look below at some of pages from my website that are on page one. (this only shows 8 on page One but their are actually 18 on the first page of Google, for this particular website). Does the keyword make grammatical sense. 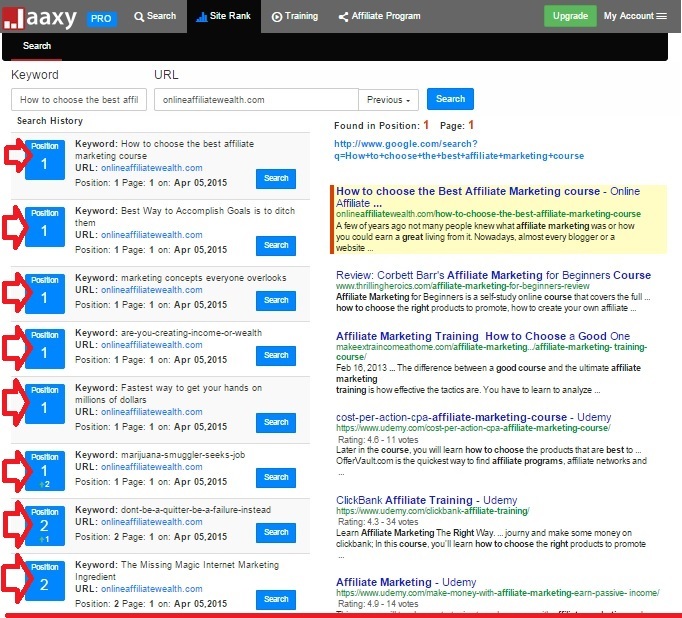 In the above screenshot you can see my long tail keyword “how to choose the best affiliate marketing course” (as shown in above screenshot as ranking on page one of Google). The tool gives me other keyword alternatives and categories to analyse. I will break them down for you down below. Domain – This last column displays whether your keywords are available as an exact match domain. You can search for them right from the site. Not only does Jaaxy offer all this but if you notice on the far right side of the image, in the black toolbar is the subheading “Brainstorm” By clicking that, there is a list of other related keywords, suggested for you if you can don’t like this grouping of keywords. So you can click on the next set and it will pull a new list into the keyword search tool without you typing a word. Okay.. Take a look at this next screen shot (below) and you will see that by using the keywords that have low competition, i.e. the QSR which shows the number of competing websites (below 100 is good) and then also having a good KQI (Green Dots which means ease of ranking). 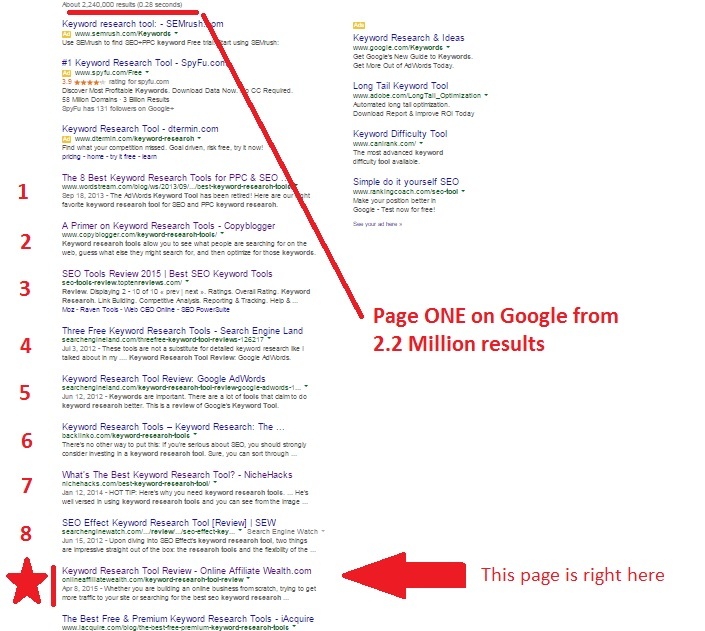 We can get page one rankings in Google, which is exactly what we have done. All those number one page rankings, all had great QSR and KQI’s as you can see from the screen shot below. 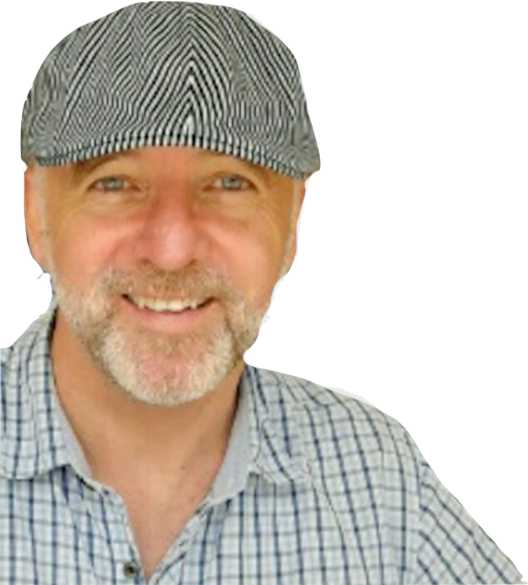 So knowing which keywords to use I then wrote great content for my pages and posts for those specific keywords and published them. Jaxxy made the whole process so easy. So that’s how I can get so many pages to rank on page one of Google and how I can create successful marketing campaigns because I know how to find an unbelievable amount of low competition keywords within any niche. When you have access to a tool like Jaaxy you to can uncover things that no other keyword research tool can provide you access to. Yes this is a powerful tool – Ready to try it out? Try your own personal research, use the keyword research box below. You can search up to 30 keywords for free. Have a play, try it out and see if you like it. The Pro Version is $19 per month (or $199 a year). 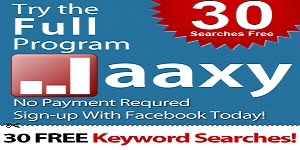 The pro version gives you unlimited searches, access to all the information that Jaxxy can compile for any keyword. The main difference between the Free version is it will show suggested/related keywords and gives you the information faster and you can do unlimited searches. 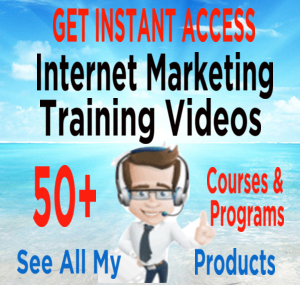 Believe me once you see how powerful this tool is you will want to do lots of searches. The Enterprise Version is $49 a month (or $499 a year). 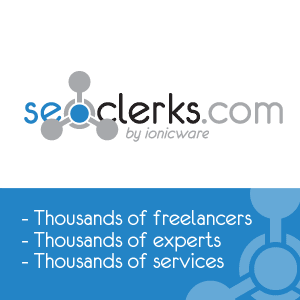 This membership will give you unlimited monthly searches and automatically show you the QSR of every keyword. The biggest difference between Pro are more related keywords, QSR is shown automatically, and results are instant this is where you want to be if you using this tool every day. Knowing how powerful it is, why would you not. Note: As a stand alone keyword research tool it’s unmatched and you can trial it here for free. There is no longer any need to search for any other keyword research tools review’s you have found the answer here. Your search is over. “Oh… One more thing; if you would like a free copy of Googles’ very own SEO Starter Guide Book you can find it here. You will find this very useful as well”. Very good read on Jaaxy KW tool. I use Jaaxy too. While using this tool I am able to find out more about my potential buyers. Jaaxy provided me with good information. Thanks to this tool I can get more visitors to my website. I use it for keyword research and it is really easy to use. Nice to be able to save keywords that we find to new list. I am very impressed at how nicely your website is put together. 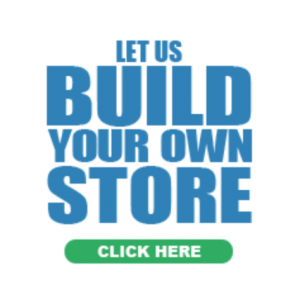 I currently use the wealthy affiliate tool because it comes with my membership. But I must admit that I like the Jaxxy keyword tool better because of the color coded KQI’s that it shows. However, The amount of searches is limited to 30 for the free version. Do you think it would be worth it to switch to the pro version when I already have the WA keyword tool? I will be honest, keyword is such a pain to me. And as you’ve mentioned it seems Jaaxy can be a solution for me. 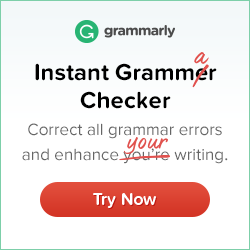 I’ve been struggling so hard with finding great keywords that are not too competitive. It seems Jaaxy can actually tell how competitive a keyword is and pull you in the right direction. My concern is whether it’s okay to just use the Pro, or is the Enterprise version a better choice? Hi. I see that you use whole sentences in your jaaxy search box, not just one keyword at a time. Is that what is getting you such good results on google. I guess if that is your keyword sentence then …bingo…you have a match. Hello Peter, thanks for the very informative article on Jaxxy. I was not familiar with them before, but now feel that they could be a very useful tool in developing my website and getting to page one on Google. Just wondering what the price range is for buying a domain name is? I wonder how many I could afford to purchase on a limited budget? Thanks again…off to do my homework. 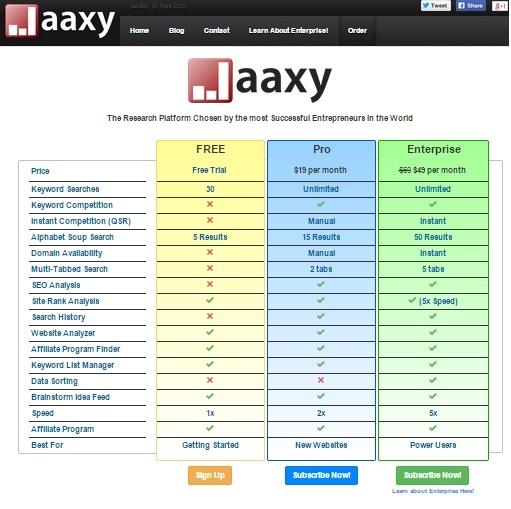 I absolutely agree that Jaaxy is possibly the most important keyword research tool there is. I have almost used up all of my 30 searches. I plan on using the Pro version after the first of the year, when I get my taxes back. I will be paying for a whole year at that time. Can’t wait! Having a keyword research tool is very important in any online business. With it, we are able to gain necessary data as to how our potential buyers are doing out there. We can easily track the keywords they usually type on the search engines such as Google, Yahoo and Bing. I personally use Jaaxy too. This tool has provided me many information about certain keywords that have traffic to it. If it is done right, I would get ranked quickly under specific search terms. This will lead to more visitors to my website, and eventually more revenue $$$. Thanks for your very in-depth and informative information, I look forward to reading your e-book, I will definitely be looking into purchasing jaxxy to get better rankings in google’s search engine. BTW, how long did it take for your kw to get in googles top 10, and also, did you use ppc? I had no idea Jaaxy was that powerful? I have used it for keyword research and find it extremely easy to use with only the information you need and none of the information you don’t. The best feature I found was that you can save keywords to lists so you can group them for future posts or projects. You explain a lot about this tool in your article. I really like the flow of your article, and the use of screenshots to show things. From your article, I see that a keyword can consist of a small sentence. That is good to know. I do have one question, what niches can this tool be used in? I am in complete agreement with you about Jaaxy, I would be lost without it. I have tried to use other methods and other keyword tools but it is just not the same as Jaaxy. The information Jaaxy puts at your fingertips comes from so many different places it would take you hours to do what it does in a few minutes. Kyle and Carson have really made a winning product here. Good post about keyword research. I agree that most people that have no any experience in SEO or keyword research tend to use Google keyword planner thinking that Google always provides the best tools though in fact it’s not so easy to use and understand, especially for newbies. It’s because as I understand it has been created for experienced users. Many people don’t even realize that there are other great keyword research tools available on the web that are much easier to use and one of such tools called Jaaxy has been designed for people with zero experience in SEO. The good news is that you can try it for free and I think it’s a real deal. I have read it over and over again that jaaxy is the number one keyword tool, Can you also tell me the number one free keyword tool which people can use if they are less serious and more casual about their online stuff, and I am just getting started with my website, yet to get a domain as well, what would you suggest a pro jaaxy account or an enterprise Jaaxy account ? I’ve never come across a keyword tool that has a certain precise competition parameter like this one. I love the way the QSR is so precise. I was paying a monthly subscription for a tool that had a sort of ‘bar’ indicator to show how the competition worked – full for a lot, empty for not so much! As you can imagine it wasn’t that helpful! So this tool has a free trial? Well worth a look really! A lot of helpful information. Covered a lot of important topics. Great post-Peter, and what a difference with the Jaaxy keyword tool. I will be definitely using this tool to do my keyword searches. Thanks for sharing such great information.